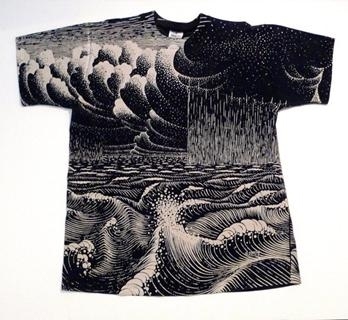 Of interest, as a fun project is the use of Escher’s artwork on apparel. Seemingly no matter the item of clothing, be it men's or women’s wear, of T-shirts, shirts, trousers, dresses and skirts, they have all be used. However, whether all these are with permissions is unlikely, although there are indeed some that are licensed by the official M. C. Escher company, and indeed, are marketed by them, to this day. Some licensed popular brands are Andazia, of at least of the 1980s and Supreme, of 2017, both detailed below. For the sake of general order, I differentiate between labels and designers, placed in alphabetical order, and then men’s and women’s wear in general. Note that, by the very nature of the investigation, I make no claims as to this being an all-exhaustive listing. Further, fashion per se is not one of my concerns. However, I have indeed my normal thorough self in its investigation, and likely what is inadvertently omitted would be relatively minor. Some instances of Escher use I exclude. 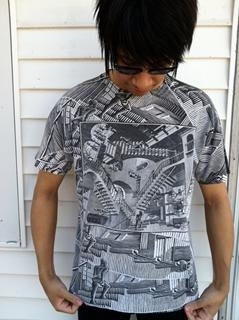 Many pirated prints of Escher’s works are used on sites such as RageOn! (described as the world's largest all-over print online store), Redbubble and CafePress, where the premise is a global online marketplace for print on demand products based on the user-submitted artwork of which then the company software generates a computer rendering, for a whole range of goods (such a clothes). For instance, RageOn! lists no less than 44 possible items! The item is then made available for purchase. These ‘homespun’ affairs I omit from the listing, only including bona fide manufacturers and designers, although where I consider some 'homespun' item is of interest, loosely defined, for whatever reason, I may make an exception and include. Note that I also exclude what can be described as a ‘tribute’ works to Escher, in the style but not actually of Escher, such as that by the noted fashion designer the late Alexander McQueen. 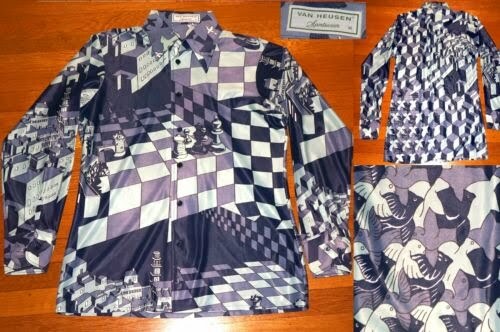 Much to be preferred, aesthetically, is apparel of an ‘overall’ design (such as Van Heusen), rather than an image of an Escher work applied to the fabric (such as Supreme), typically of a square format. By the very nature, an ‘overall’ design is of a more substantial nature and is vastly more appealing. Where dates are given, this should be regarded with due caution at times. Typically, the owner of the item is lax on the matter, guessing or giving a date of Escher’s work per se, leading to misinterpretation. 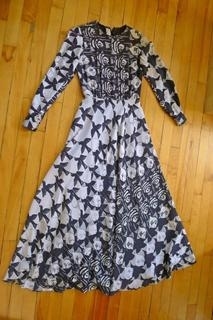 Note that at times in the literature, the terms ‘Escher dress’, ‘Escher shirt’ etc. 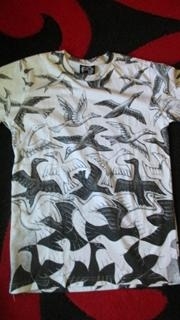 are somewhat misleading, and in fact sometimes refer to apparel that has nothing to do with Escher whatsoever! Simply stated, some writers extend the description of Escher's unique geometrical works, believing any geometric design to be described quite fairly as Escher-like! Obviously, this is not so! Note that as such, establishing the copyright holder of the photos is an invidious task, in that either it is not given, or they are successively ‘borrowing’ each time that tracking down the original is simply not practical. This being so, I have unashamedly not pursued the photo owner, in contrast to my general policy. If anyone’s copyright has been infringed, I would be only too pleased to give due credit or remove if preferred. 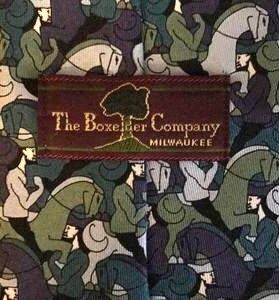 The US company Boxelder, Inc, under the leadership of Jim Stratte, have since 1989 (and continuing to the present day), been marketing ties, in silk (and scarves, too), with a whole host of Escher imagery. Indeed, in the early days, these proved very popular indeed, with 30,000-40,000 a year sold, which coincided with the yuppie period, and featured on the cover of Signals catalogue. Further, they were marketed by the Museum Company, a chain store, opening stores in shopping malls. However since those heady days, neckties have gone out of style, and the museum market has faded; the company closed completely in 2002 and the catalogue business died. 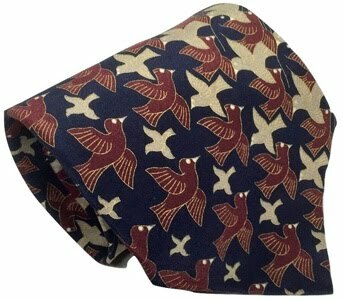 Even so, Boxelder still sells a respectable 4,000 Escher ties a year. Further, of note is that famous people and celebrities have been seen sporting the ties, notably including President Bill Clinton, who is shown pictured and discussed in the famous people/celebrity section below. Dress and trousers by the noted French/USA fashion designer Catherine Malandrino, autumn, 2009 collection, with the prints ‘Liberation’ and 'Relativity'. Nothing is known as to this company! I have seen the same name used for labels but as a different logo. Whether these are the same company is unclear. Used is ‘Swans’ tessellation, periodic drawing 96, albeit with a different colouring. ILGWU or the International Ladies Garment Worker Union was formed in 1900. In 1935 the union became part of CIO. Tags are notable for their “AFL-CIO” attribution or lack thereof. The AFL and the CIO merged in 1955, therefore any ILGWU labels with AFL-CIO (look closely, as it is often very small) on them are post-55. In 1974 the labels were changed to a red, white, and blue colour scheme. This was in conjunction with their efforts to urge Americans to not buy imported goods: Buy American: The Job You Save May Be Your Own. The ILGWU remained active up until 1995, when they merged with another union, Amalgamated Clothing Workers of America, to form UNITE. As can be seen, the label here is of red, white and blue, so this is from 1974 to 1995. 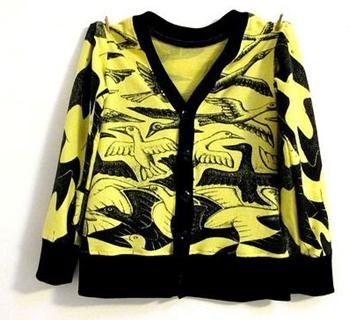 A seemingly early instance that was a false dawn is that of an Escher shirt with ‘Two Birds’, periodic drawing 18, with a ‘Pierre Pascal’ (presumed French) label, at a Netherlands textile museum, Tilburg, described as of the 1950s. However, this attribution is misleading; upon correspondence with them, this was nothing more than an educated guess. Interestingly, the same sheet it is also seen with a different French label, Michel Axel. I see that the company is still in business and is a notable concern, although apparently the shirt is no longer stocked. 'Roland’, features an amalgamation of the print ‘Day and Night’. However, background details are essentially unknown. All that is stated is ‘1970s Vintage M.C. 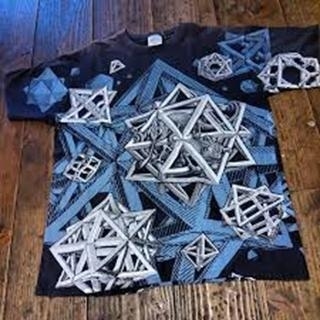 Escher Poly-Shirt’. Founded in 1976, in Alabama, USA, by Terry Wylie. A variety of Escher’s works are used. Van Heusen describes themselves as the best-selling dress shirt brand in the world. However, I have not been able to find out any more detail on this, for now at least, single instance, of a shirt. Used is ‘Metamorphosis III'. In 1961 The Betty Barclay Fashion Group, who own a collective of fashion brands, first developed the Vera Mont collection. The brand concentrates on formal evening, cocktail and bridal fashions. The brand (under the Betty Barclay Fashion Group) continues to the present day (2018). Betty Barclay Fashion Group is seemingly now a Germany-based company, with numerous branches. Whether there was ever an actual person named Vera Mont is unclear, and what, if any, connection there is to France is likewise as well. As ever, does anyone know more on this? 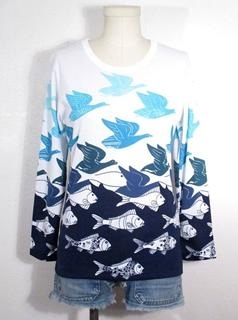 As such, the first instance of use appears to date back to the late 1960s, with a company known as ‘Water Witch’ in Maine, USA, who marketed Batik fabric with Escher's ‘Sky and Water I’ birds and fish. However, there is seemingly next to nothing known in this instance or the company itself. Although they are listed in the US ‘Maine Business Directory’, this is seemingly more of a legacy detail, rather than anything else. Upon alerting Jeffrey Price, my US-based Escher research collaborator to this, he phoned the number given, but this was not operational. Likely they have been out of business for a considerable while. Previously, in 2012, Escher in het Paleis museum put out a plea for details on the company, and of which it appears that this went unanswered. Does anyone know of this? Any detail, no matter how small or thought insignificant, would be of interest. Of interest is the ‘endorsement’ of Escher by celebrities and famous people, with just three known instances, most notably of President Bill Clinton, and also the actor Lindsay Lohan and singer/songwriter Justin Bieber. 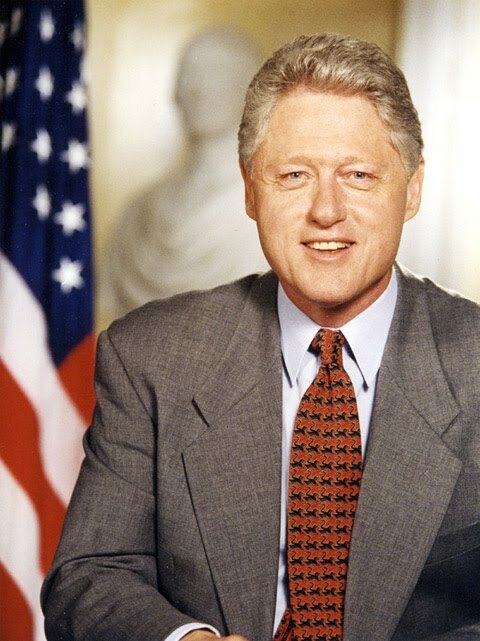 Undoubtedly, the most illustrious person is President Bill Clinton, wearing an Escher tie by Boxelder, Inc., (also see the company discussion above) although it is not known as to his extent of interest in Escher, although he must presumably be aware of him. The tie he is sporting is of Escher’s ‘Swan’ periodic drawing, No. 96. The background to this is that he was going to wear it his second inauguration, in 1997. However, at the last minute, in the holding room, he changed his mind, considering it ‘a little busy’, and opted for a more sombre choice instead. This is the earliest known celebrity/famous people endorsement. Other celebrity/famous tie people possibly include multi-billionaire Warren Buffett of Berkshire Hathaway Inc., an American multinational conglomerate holding company and Paul Shaffer from late night talk show host David Letterman, although details are sketchy, with no pictures are available. 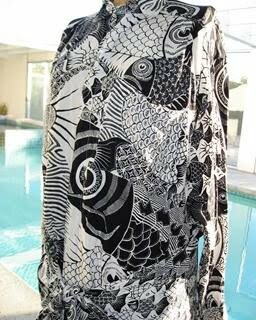 Lindsay Lohan can be seen sporting an Escher-themed dress, ‘Day and Night’, whilst shopping in Malibu, California, of 2006. The background to this is unknown. I tweeted her asking for details, but she didn’t respond. Interestingly, the choice of wear may be no accident. It is possible she has a mathematical interest, as Wikipedia states ‘… she did well in science and mathematics, until grade 11….’. She may have her troubles, but a lack of taste is certainly not one! 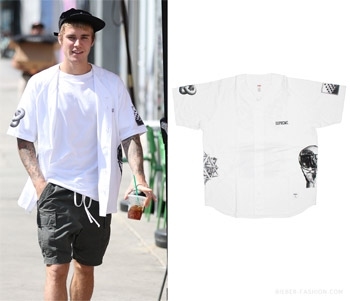 Justin Bieber is pictured with a Supreme item, of 2017, of which again, the background to this is unknown. Of interest is the ‘endorsement’ of Escher by mathematicians/scientists, with again two just known instances, John Horton Conway and Douglas Hofstadter. Does anyone know of others? 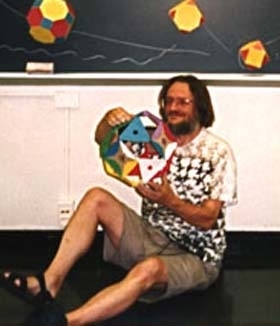 John Horton Conway, FRS (born 26 December, 1937) is an English mathematician active in the theory of finite groups, knot theory, number theory, combinatorial game theory and coding theory. He has also contributed to many branches of recreational mathematics, notably the invention of the cellular automaton called the Game of Life. Conway is currently Professor Emeritus of Mathematics at Princeton University in New Jersey. 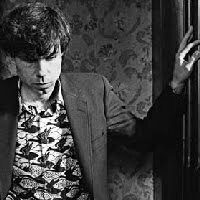 Douglas Richard Hofstadter (born February 15, 1945) is an American professor of cognitive science whose research focuses on the sense of self in relation to the external world, consciousness, analogy-making, artistic creation, literary translation, and discovery in mathematics and physics. Hofstadter's book Gödel, Escher, Bach: An Eternal Golden Braid, first published in 1979, won both the Pulitzer Prize for general non-fiction and a National Book Award (at that time called The American Book Award) for Science. 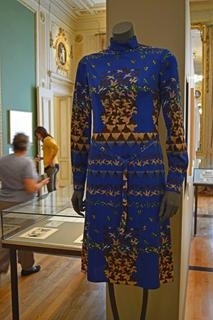 The blue dress (9) with ‘Liberation’ variation was displayed at the Escher in het Paleis museum. However, whom this was by is not known. 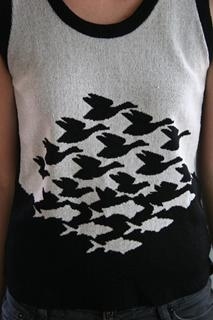 Although not strictly of an actual Escher image, included here is an example of knitwear (11), of which by the very means of production, this is more of a tribute nature. However, the better ones are indeed of sufficient verisimilitude to an actual image of Escher that I have deemed to include. The knitwear is said to be of ‘Campus Casuals’, of California, US, seemingly of a major concern, with apparel of the 1960s, and continuing, although whether this garment is indeed of that earliest time I doubt. Whether they are still in business is unclear. Does anyone know more of the company? Further examples of knitwear can be seen on the Revelry site, link below. As can be seen, there is a wide variety of Escher's works used, with no one tessellation or print dominating. However, some are more prominent than others, such as ‘Day and Night’, 'Metamorphosis III' and 'Liberation'. 1. Does anyone know of Water Witch? And were they indeed the first? 2. Do you have a suitable example for inclusion? 3. Does anyone know of more mathematicians/scientists and celebrities endorsing Escher? 4. Generally, I would like to know more background detail as to the labels and designers, especially where the details given are sparse. Related to this is I would like to know is why the designer or label chose an Escher artwork. I have not been able to establish a single instance! 5. Or indeed, have anything to add in a general sense. Jeffrey Price for details on Water Witch. Jim Stratte, of Boxelder, Inc., on company background and on President Bill Clinton.